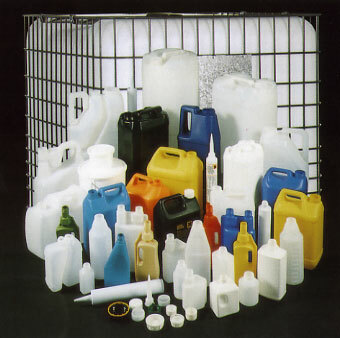 Many strong solvents and aggressive chemicals cannot be stored in plastic due to permeation, evaporation, softening and attack. Bettix fluorination could solve your problems - pushing the traditional boundaries of how and where plastic containers are used. Bettix Ltd, Bolton was the first post-moulding fluorination barrier treatment plant in Europe, built under licence from the USA. It has long been accepted that a fluorination barrier to polyethylene and other polymeric materials renders them resistant to attack and resulting permeation by a range of aggressive chemicals. The unique FLUORO-SEAL process by Bettix ensures uniformity of fluorination treatment which can be particularly important around the neck area and protects the container exterior from splashes and drips. Stackable and straight sided PP pails and pots along with their lids can be Fluoro-Seal treated to gain the same benefits as PE bottles. The current size ranges from 1000 litre IBC’s to 10ml vials plus their caps. We are also able to fluorinate complicated technical mouldings. The fluorinated layer is not a coating or lacquer; it is a chemical conversion of the existing surface and as such is atomically bonded to the parent plastic. The treatment is permanent and the layer is not readily removable nor does it become unbound with time. Plastic container manufacturers can now offer their customer a ready treated fluorinated container of their choice, through the Bettix Fluoro-Seal process. Customers can forward items direct to Bettix for treatments if preferred. We are happy to supply samples of our products on request. If you require a sample, please click here to get in contact with our sales team.